The region around Lake Como is recognized as one of the most beautiful places in Italy. Located in Lombardy, it starts from the foot of the Alps close to the Italian border with Switzerland and runs 30 miles southwards forming an inverted Y. The region has great views with a stunning backdrop of the Alps. It is a part of Italy that continues to attract prominent names in the entertainment and business industries including movie actors and business moguls from all corners of the world. Movie actor George Clooney owns a home around the lake. The allure of property in Lake Como Italy can also be attributed to the chic beauty of the lakeside properties which was popularised even more after the lake was featured in Star Wars: Attack of the Clones and in the James Bond movie Casino Royale. 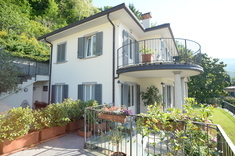 The relaxed atmosphere and beautiful scenery makes Lake Como property for sale quite pricey. The invasion of prominent personalities and the wealthy has made the area one of the costliest properties in Italy with values rising at an average of 5% annually. However the satisfaction and prestige of owning a home in this enviable region makes it worth the price. Fortunately, you do not need to be a millionaire to own property around Lake Como. There are cheaper options in the surrounding areas especially further north of the lake. There are many reasons why everyone dreams of owning property in Lake Como. Besides the desire to be a next door neighbour to a celebrity, most people are attracted to this lakeside region by its stunning postcard beauty. Lake Como is the third largest lake in Italy. The others are Lake Garda and Lake Maggiore. With approximately 145 square kilometres of calm blue water, the lake overlooks scenic mountains and woodland. The marvellous views stretch all around its 180 square kilometres of coastline in picturesque towns such as Bellagio, Varenna, and Menaggio. At Varenna the lake splits into two forks one extending all the way to Como while the other one ends at Lecco. Bellagio is popularly known as the “Pearl of the Lake” and is considered by many as Europe’s prettiest town. Walking along the charming town’s cobbled streets with the mountainous views on the background as you breath the region’s clean air is a treat of a lifetime. You can also connect to other towns such as Menaggio or Varenna via a ferry ride as you watch the high Alps’ peaks soaring regally in the background. The region is served by six airports from Verona, Milan, Brescia, and Lugano on the Swiss side. Lake Como is also renowned for its rich mix of Italian and Swiss cultures with a diverse cuisine and wine traditions. These are just a few of the reasons why there is always a high demand for property in this region. Despite the popularized notion about Lake Como being an exclusive for multi-millionaires, there are affordable options in many surrounding areas. You would still enjoy the same stunning views as the billionaires in locations such as Laglio and Sorico. For around 100,000 Euros, you can get a beautiful home with a northeastern view of the lake at Sorico which is just 80 km north of Milan. You can even get an apartment in Laglio for under 140,000 Euros or even a 2 bedroom flat for around 400,000 Euros. The town of Lenno which is only 10 km away has many affordable houses for sale in Lake Como too. Other places with great bargains for homes or even villas for sale include Tremezzo and other towns up north such as Domaso, Musso, and Pianello. You really do not need to have a multi-million bank account to own property around Lake Como.